It's summertime! That means it's peak season for company outings, team building, and team bonding. These programs are geared towards building better relationships among colleagues. The idea is consistent with Sirota's theory. He postulates that camaraderie among work colleagues is an important factor in human motivation at the workplace. People are more motivated to work in an environment when they enjoy the company of their colleagues. Below is a list of fun group activities and team bonding ideas. These will help maximize your company outing this summer. Cebu Teambuilding Services would be more than happy to assist you organize any of these activities. You may contact us at +63923 317 3433 (Sun Cellular) or +63916 291 8488 (Globe). Or email thadzonline@gmail.com. Island hopping is one of the more popular fun group activities and team bonding ideas for company outings. Since it is summer, seas are not expected to be rough. The weather is most likely sunny. There is very little chance of rain. The popularity of this activity also owes to the fact that it is very easy to organize. Many beautiful islands are accessible through Mactan. Not too far from Cebu City or Mandaue City where most companies are based. Bring about a feeling of nostalgia. 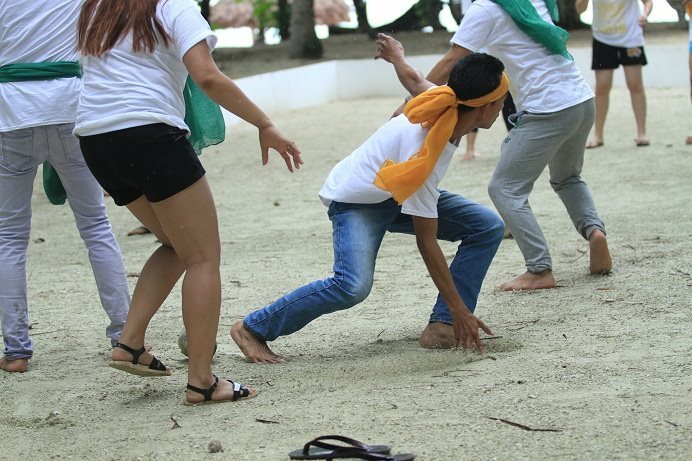 Let your colleagues at work relive their childhood playing traditional Filipino games. Takyan, patintero, syatong, luksong lubid, luksong tinik, tabanog, tiyakad, and shakay are some of these games.